William Greenleaf Eliot, 1811-1887 The Story of Archer Alexander: From Slavery to Freedom, March 30, 1863. 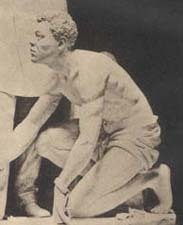 The Story of Archer Alexander: From Slavery to Freedom, March 30, 1863. Boston: Cupples, Upham and Company; Old Corner Bookstore, 1885. Lincoln, Abraham, 1809-1865 -- Monuments. Lovejoy, Elijah P. (Elijah Parish), 1802-1837. Slavery -- Missouri -- History -- 19th century.